Maureen Garvie: Not so much a whodunnit as a whogottit! Not so much a whodunnit as a whogottit! the public library, police focus on the library staff. as a single woman bewilderingly complex. “Withdrawn from Circulation is a compelling mystery, but it is also a wonderful novel in its own right. The murder might tie all the threads together at the end, but it is a delight to just follow the intrigues with Greer’s mind. It’s the third book to be published by the small Kingston press Cowdy House, run by Christina Decarie and Darryl Berger. It’s being released as both a paper book and an ebook. Anne of Anne of Green Gables, Jo in Little Women, Nancy Drew of The Hidden Staircase: growing up, we were these girls, strong and bold. We knew what to do. Make things right, solve the mystery, and get everybody home on time for supper. So what happens to Nancy Drews when they grow up? Jobs happen. Men happen. Loss of innocence happens. New rules, new needs for decisions appear: we are compelled to 'mate,' make out of some happenstance meeting the stuff of a lifetime of commitment and caring. It looks good in the photographs. 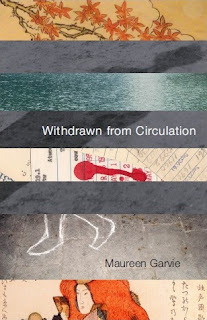 In Withdrawn from Circulation, Maureen Garvie brings us grown-up Greer McCallister, a 39-year-old librarian breaking out of the ideal constellation of job, house and perfect husband. 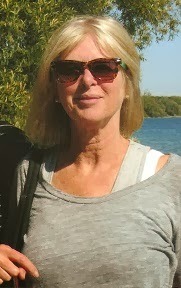 Her husband, Tom, is a bon vivant, epicurean, teacher-turned-school-board employee. With their two jobs (and dual bank accounts), middle-class comforts roll out for 17 happy-enough years. Their life without strings moves along into a distant future like a first class car chugging through the Rockies. Lots of goodies. No worries. So what is wrong with this picture? Greer McAllister has a literary daughter (or should we say mother? ): 13-year-old Leia Greenway, the protagonist of Lake Rules, Garvie's 2005 YA novel. In it Leia leads her brothers and new friend Cass through a series of detected mysteries with the aplomb of Nancy Drew (1930s version) on a new case. Ghosts of Greenway live on in fragments of the psyche of Greer. We can tell she was once the adventurous teen at home in cottage land, plunging nilly-willy into frigid and unknown waters in her underwear. We just know that at one time she was one great Nancy Drew – or Leia Greenway. But in this case, Greer's case, the mystery is internal as well as external. Someone has died; there are reasons to believe Greer is in some way responsible. But the real mystery goes on inside her mind, where passion and impulse drive her further into terra incognito. Being a librarian has made her an expert in classifying the known, organizing it by Dewey number, assigning it to a shelf. In leaving Tom, Greer sets out for the unknown where the knowledge she seeks is no longer classifiable or even nameable. While the external mystery unravels like a good whodunnit, Garvie' s prowess as novelist/ psyche-explorer takes hold in her descriptions of Greer’s internal landscape and its never-ending production of desires, dreams, illusions, lusts, impulses and dread. In flight from conventional marital touchstones, Greer actually sets out for something small, contained, and very private. What she gets is a life blown apart by investigations, threats, real and imagined, and a powerful drive toward the one man she cannot have. Nancy Drew, all grown up, is out of her canoe and at the wheel of a leaky ship not quite up to stormy weather breaking out everywhere. Into this heaving open sea comes just a little self-knowledge. In The Book of Tea (Okakura Kakuzo), which she buys for her lover, she reads what may be her life's greatest discovery: "worship of the Imperfect … a tender attempt to accomplish something possible in this impossible thing we know as life." Something possible, something beautiful, forms the rainbow that comes after the storm. A stronger, wiser, sadder Greer now heads off in that direction.